Energising Vinyasa Flow classes and still Meditative Yin practice. Each Class is different, with creative sequencing complimented by carefully complied playlists. For Danny, yoga is less about creating perfect postures during the class, and more about what we feel in the asana, and the movement between them. Focus is on connecting the mind back into the body, and working with the breath to do this. She also has a strong passion for alignment in order to work safely, and open the body slowly and carefully during postures. Come to rest and recuperate. 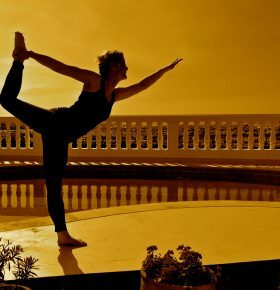 Yoga in the morning and late afternoon, relax in the day and enjoy the evening with delicious food, sunset and a perhaps a glass of wine…. Danny has practiced yoga for 25 years and has been teaching for 5, with over 1500 teaching hours behind her. She teaches regular classes in Brighton and Hove, running her first retreat in June 2017 to Morocco. Dancing and particularly ballet was her main focus during her youth, and this connection with the body and movement is sensed through her classes. Although Danny’s classes are certainly not always slow or simple, she is a great believer in less is more, in many aspects of yoga and life in general.